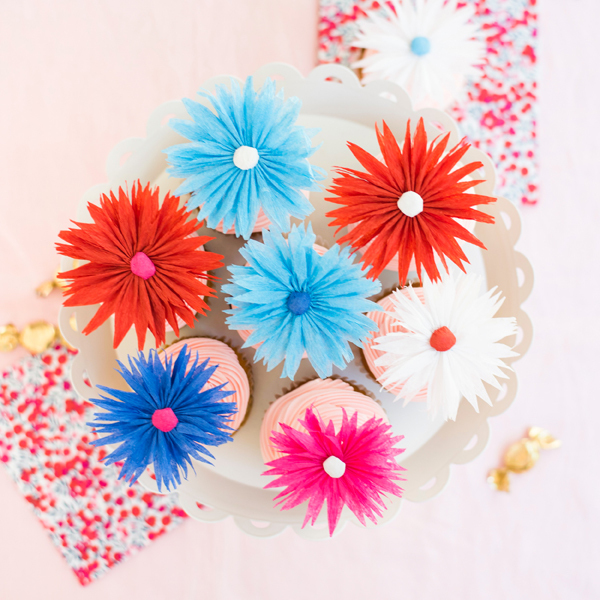 Festive flowers in red, white and blue (and pink) scream Happy 4th of July! 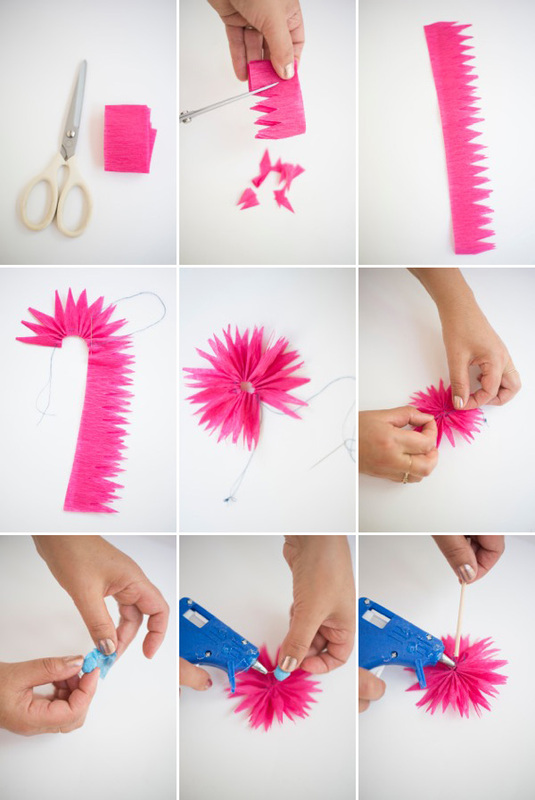 But the neat thing about this DIY is that you can make these pleated flowers in any color of the rainbow, for any party. Pale pink, yellow and pale blue for a baby shower, or say, lavender and mint for a unicorn party! 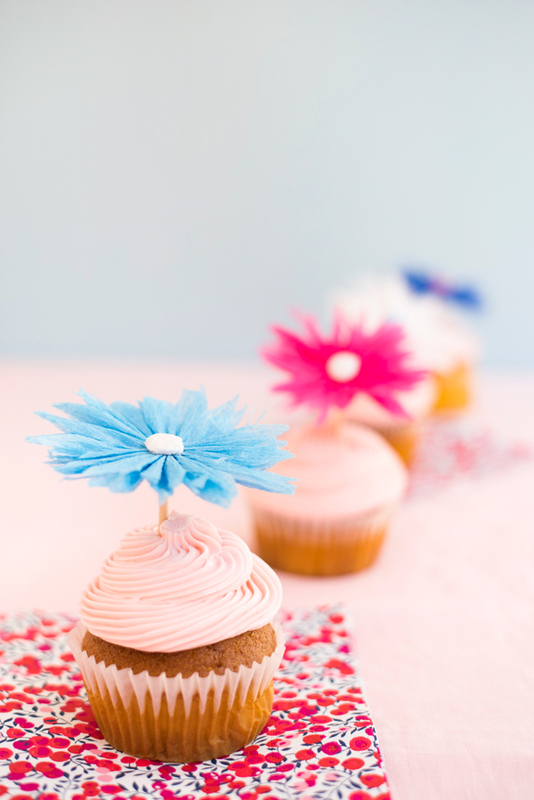 Just be sure to keep the flowers elevated off the frosting, as streamers are not food safe materials. 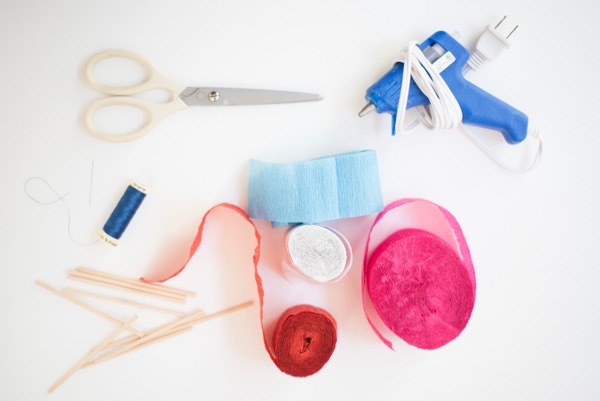 And like any other handmade toppers you might want to save for the next party, just wipe the sticks off with a damp paper towel and store in a tin ’til next time. 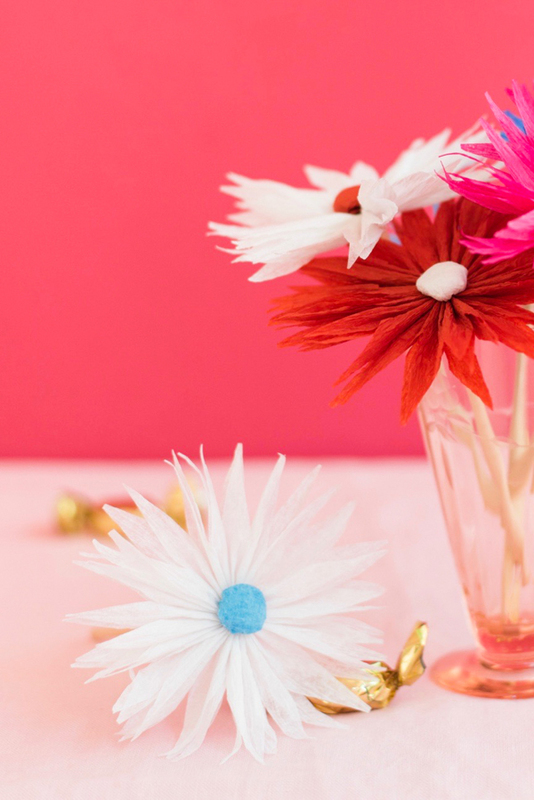 PS: These are also cute for table decorations, gift toppers, party hat or headband flair, or a pretty wreath. 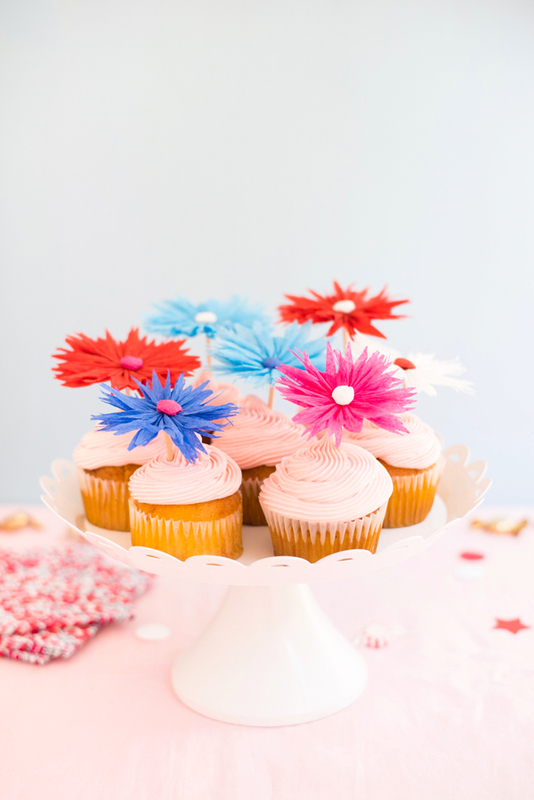 Materials needed: red, white, blues and pink streamers, scissors, thread and needle, hot glue gun, cake pop sticks (or craft sticks). Step 1: Cut a 24” piece of crepe paper streamer. Fold in half, in half again, and in half again until you have an approx. 2-3” rectangle. Step 2: Cut zigzags into one side of the streamer. Step 3: Unfold until you have 2 layers. Gently adjust them a little so the zig zags do not match up. Step 4: Take a threaded needle and begin a running stitch (in and out) along the straight edge of the streamer. Make about 6-8 stitches, then pull the thread gently through the paper. Step 5: When you get to the end, leave some thread hanging. Pull the thread from each side, gathering the paper together in the center of the thread. Step 6: Carefully tie a triple knot in the thread, joining the two sides of the paper. Gently open and fluff the flower around the knot. Trim the ends of the thread. Step 7: With a different color crepe paper, make a button sized shape of rolled and folded crepe paper. Step 8: With hot glue, attach the button to the center of the flower. 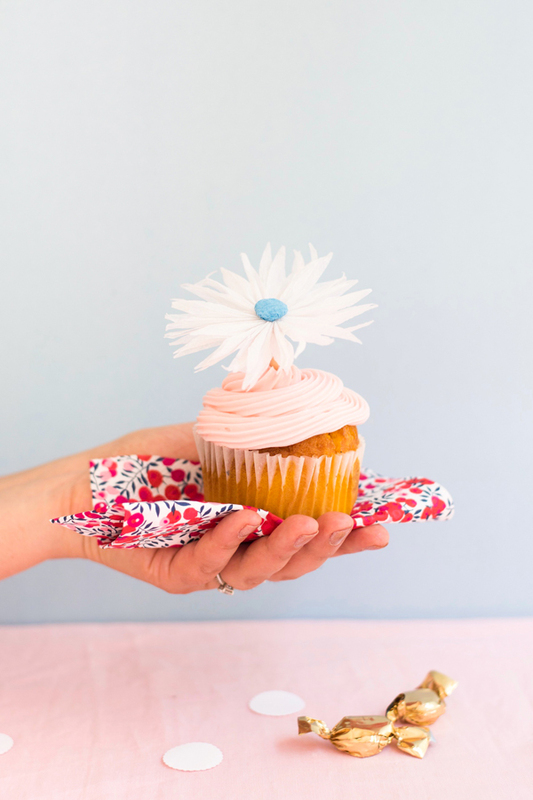 Step 9: Flip the flower over, and with hot glue, attach the cake pop stick to the bottom of the flower. They look so delicate and beautiful! I love these! 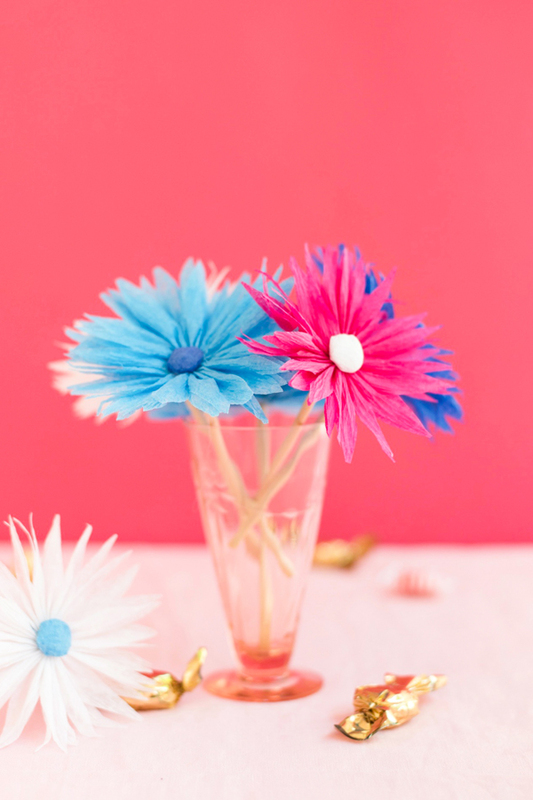 I’ve always been a bit intimidated by paper flowers but have always admired them. These definitely seem like something I could give a try! These toppers are so cute! So pretty. They’d be great at a bridal shower too.